Messenger programs – an integral part of today’s online community. They are services for instant messaging and relevant information exchange between users of the same network. Multifunctional Facebook Messenger has become one of the undisputed leaders on the market. This speed communication tool is the second most popular messenger in the world and yields by the number of users only to the WhatsApp application. It is great for personal contacts, as well as for the organization of high-quality communication with colleagues, partners and clients of the company. Facebook Messenger belongs to the multi-platform solutions, it has broad functionality and its fan audience. the ability to monitor the activity of other chat users and much more. Regular updating and expanding the applications functionality attracted the interest of commercial entities. It is used actively in corporate communication and establishing contacts with regular customers. Setting up a connection to the Facebook Messenger on a company’s website will attract a great number of interested users. It will provide high-quality feedback and improve service. 1. Modal window creation by Wow Modal Windows Pro. Creating a connection to the Facebook Messenger via the outputting by user modal window makes possible to establish high quality and non-intrusive feedback on a site. Plugin Wow Modal Windows Pro is simple and easy to use. It has a powerful set of tools for creating and customizing interactive panels. In this example the window output accessed via the dedicated button. To create it, a new element must be added through the plug-in menu and given a specific name for further easy administration. Fig. 1 Creating the modal window by Wow Modal Windows Pro plugin. You must set the display mode for the resulting popup window while pressing the button. For this purpose, in «Button» menu “Show button” option has to be changed to a positive value. Fig. 2 Adjusting the modal window pop-up via the button. color change when pointing at it. enter the text «Messenger» in the field. The example shows demonstration mode of the modal window (and the button itself) on all pages for all its visitors. You can change settings for specific requests via the “Show modal window” on the menus right side. Fig. 4 Adjusting the modal window display parameters. 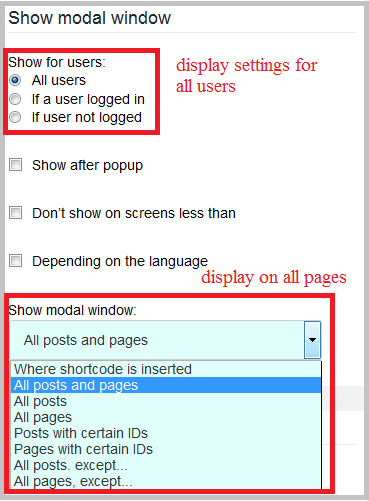 To remove the modal window popup effect, which was chosen as a default one, when loading a page, the settings of its display should be changed. It is enough to change the demonstration mode in the menu “Display” for the link opening. Fig. 5 Changing the window behavior on the page. Fig. 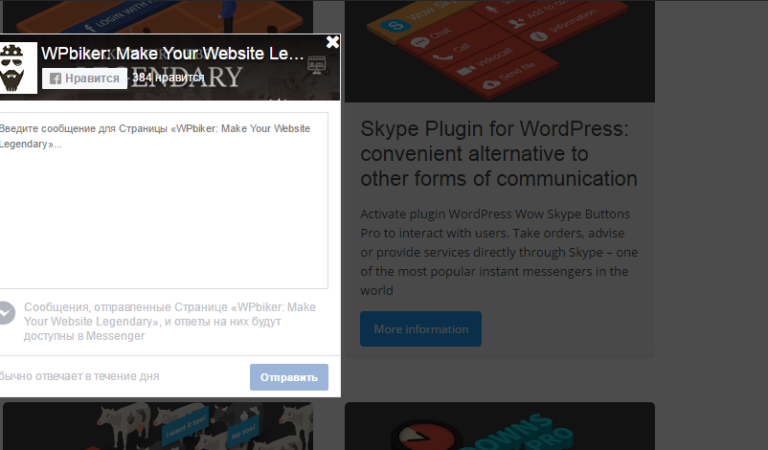 6 Set of styles to change the pop-up window appearance and its location on the page. The rest are the default settings. For the closing button only the size was changed up to 12 pt. Fig. 7 Settings for the closing button styling. 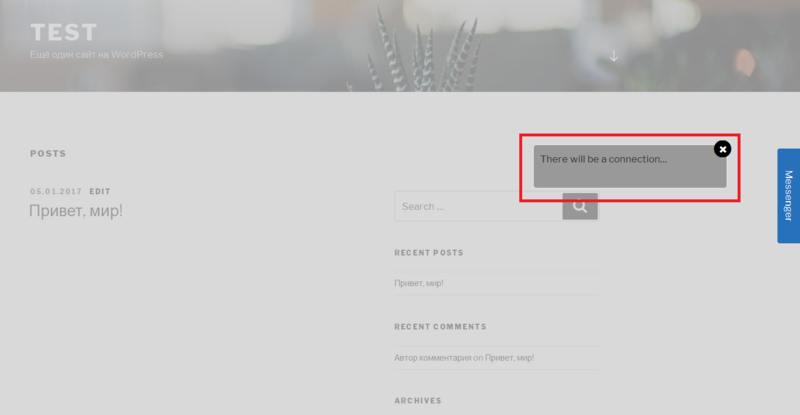 After saving the modified properties, you can check the buttons operation on the page. Clicking on it displays the modal window with all settings. Fig. 8 Modal window popping-up on a page. The modal window is completely ready for use and filling. Now you must configure the connection to the Facebook messenger. 2. Connecting Facebook Messenger to the site via the created modal window. The popular platform offers a set of tools for developers and administrators – Facebook for developers. Various social plugins deserve special attention. They allow you to share information from their pages, create subscriptions, and more through the use of third-party resources. customization of the page external demonstration (profile photo exposure, using a small header and other). Fig. 9 Using the “Page” social plugin. As an example, in the appropriate field the company’s page address is set: https://www.facebook.com/wowaffect/. Tab type for messaging is selected. Embeddable object is adapted to the containers width, where it will be located. After clicking on the button “Get the code”, a window appears with the generated code. It takes into account pre-selected settings for the insertion object. Integration framing method has been selected as an example. Fig. 10 The insertion code in a modal window on the page. It is enough to copy and paste the code into the pop-up box editor. You need to select the text display information in the settings. Using this tab, you can add and edit HTML-code. Fig. 11 Inserting the messenger into the modal window. 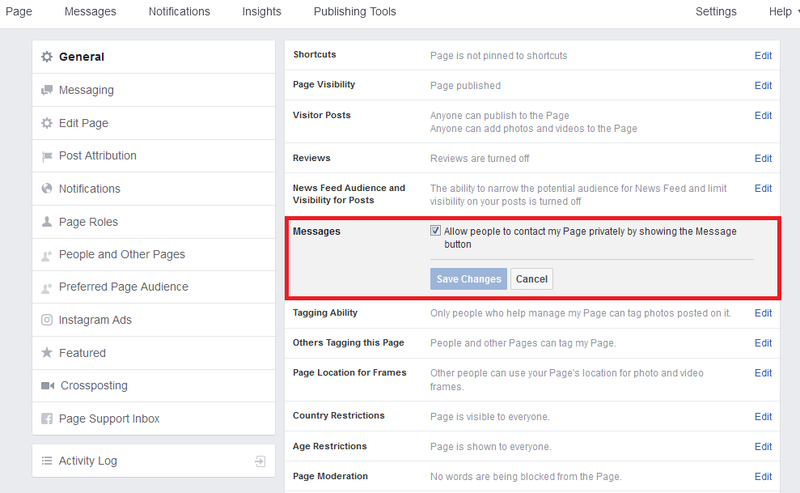 To receive messages from users, it is necessary to enable this option and save the changes in the company’s common page settings on Facebook. Fig. 12 Changing the settings on Facebook to receive messages. Facebook Messenger, connected via the modal window on a site, requires the user prior authorization in the social network. After confirming your username and password, you can freely use the messenger. Fig. 13 Fully working Facebook Messenger on the test site. Logging in and sending a message.